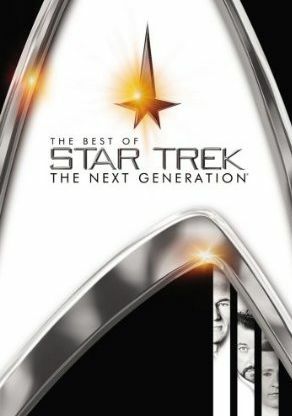 Thanks to the success of the new Star Trek movie, two new best-of Star Trek DVDs have been released, one for the original series and one for the Next Generation. Each DVD contains four episodes, and while I'm not sure I'd consider the episodes to be the best of the best, I do think they are some of the better episodes and would be a good introduction for those who are new to the two shows. For those of you that already own every episode on DVD, there's really no reason for you to watch these, but for those like me who do not and have not seen the episodes for a while, it was very enjoyable to see these episodes again. 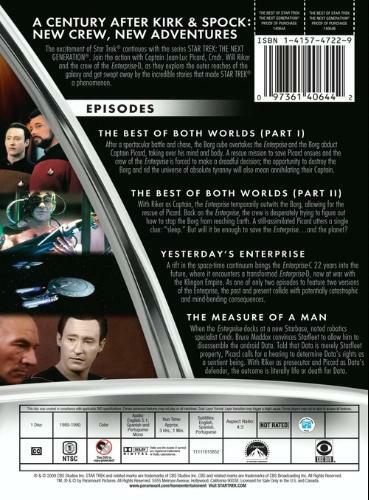 The first episode on The Next Generation disc is actually part one of a two part episode entitled Best of Both Worlds . The Enterprise responds to a colony's distress call only to find that they colony has been wiped off the face of the planet! It is believed that this colony, along with several others, were destroyed by the Borg, a race of powerful and highly advanced cyborgs. A new character, Lt. Commander Shelby, is introduced, who is not just an expert on the Borg, but who is also aiming to replace second-in-command Riker, who has been offered his own command. The rivalry between the two characters and the threat of Borg really makes for some great television, and it only gets better from there. Towards the end of the first episode, Picard, captain of the Starship Enterprise, gets captured by the Borg, putting Riker in charge of the ship. A plan is devised to rescue the captain, but it fails, and now the Borg knows everything the captain knows, making it all that more difficult to defeat them. And as if things didn't look bleak enough, the Borg ship is heading straight for Earth to assimilate the entire population into the Borg collective. It's going to take some series brain work to think of a way out of this seemingly impossible situation! The third episode on the DVD is called Yesterday's Enterprise , and is one of my personal favorites. Here, the Enterprise encounters an anomaly in space through which an older Federation starship appears. But it's not just any old Federation starship, it's the previous incarnation of the Enterprise which was destroyed over twenty years ago. And not only that, but as soon as the Enterprise C makes its way through the anomaly into the present, the current Enterprise D morphs into a battleship rather than a ship of exploration. The only person on board the Enterprise D who realizes anything is wrong is Guinan, the mysterious alien bartender played by Whoopi Goldberg. Based on her feelings and a prediction of what might have been had the other ship not come through the anomaly, Picard must decided whether to send the ship back which would kill all aboard, or keep the ship and crew to help fight in the war with the Klingons, and all while trying to fend off an attack from several Klingon ships. The fourth and final episode, unlike the other three, contains no action whatsoever. This one is called The Measure of A Man , and finds a slimy scientist who used to work with the android Lt. Commander Data return to essentially take him apart. Slimy scientist guy wants to do this so that he can study Data more in the hopes of creating tons of androids, yet the process could kill data, and so a trial is set up to determine whether or not Data is a living being or property of Starfleet, thus basically determining if he lives or dies, and more broadly if additinal androids are created in the future, whether they will be free or slaves. It's kind of a thought-provoking episode, except that if you've been watching the series from the beginning, then you really only see Data as a living being, despite him being made of metal, so there really is not question as to whether or not he is alive. That's it for the episodes, and there are no DVD extra features aside from a preview, so that was a bit disappointing. A commentary or something would have been really nice. The quality of the video is just about what you would expect from a show originating back in the 1980s. It's not bad but it's obvious they didn't try to spruce it up at all. Anyway, if you like Star Trek or are just curious and like me you don't have time to watch every episode of every season, this is a good DVD to check out.